The most difficult part of learning how to draw is trusting your eyes. When most people start to draw, they let their brains trick them into not believing their eyes. The realism in art comes by way of illusions. Because the surface we are working on is flat, we have to use optical illusions to make it feel like three-dimensional space. 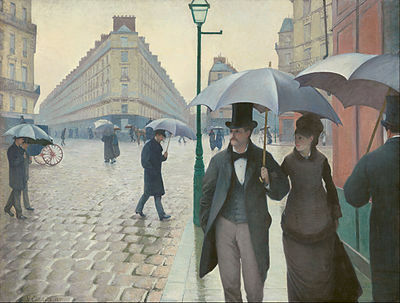 On the left hand side are the people furthest away from us in the painting. And they’re teeny tiny! Next is the man walking across the street—he’s about three times their size. 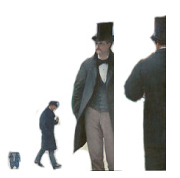 The man third from the left is the focal point in the painting and again 2-3 times the size of the last man. On the right hand side is the man closest to us in the painting and the largest of the four. The same is true of architecture. 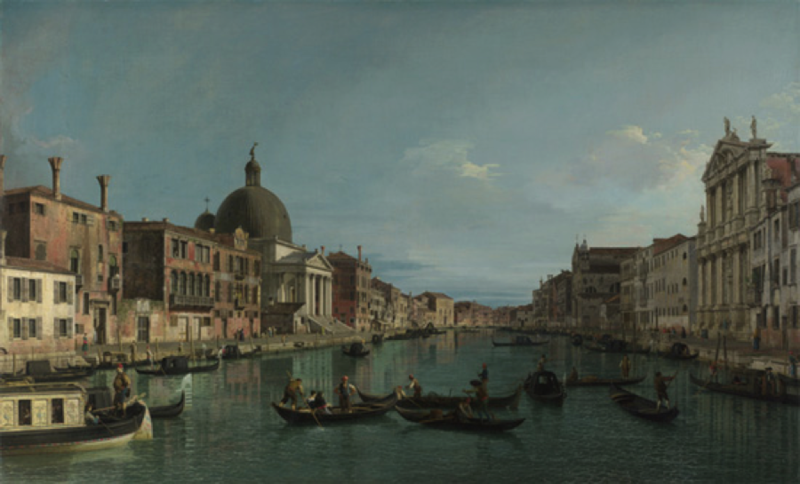 As buildings move further into the scene, they get smaller and smaller, creating a path for the eye to wander down and into the world depicted by the artist. To learn to trust our eyes and not our brains (tricky devils!) we are going to do a blind contour drawing. A blind contour drawing has you drawing an object without looking at your paper or lifting your hand off the paper as you draw. You can use any object to do a blind contour drawing with. I like using hands because they’re complicated enough to make you really pay attention and because they’re always around! I just did one myself to show you how silly it will look no matter what your skill level is! Exercise One: Make A Blind Contour Drawing. Get your sketchbook and a pencil. Sit someplace comfortable with your sketchbook on your lap or a table. 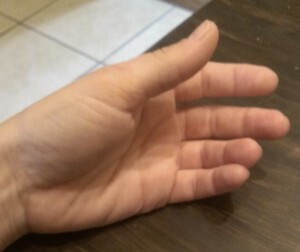 Hold one hand out in front of you (whichever one you’re not drawing with) and keep it in one position. If you don’t have a hand available to draw, try a foot. Now, WITHOUT LOOKING AT YOUR PAPER start drawing your hand/foot. Don’t lift your pencil off the paper—draw in one continuous line. Trace the lines of your hand or foot inside and out—don’t just draw the outline of your hand but link your hand with your eye and get all the little wrinkles and freckles and fingernails/toenails too. DON’T PEEK AT YOUR PAPER UNTIL YOU ARE FINISHED! This exercise is not about getting a perfect drawing, so don’t even think about that while you’re doing the blind contour. This exercise is about not thinking but letting your eyes and hand talk directly to each other without your brain interfering. Trust your eyes and look—really look—at your hand. Go as slow as you need to so as not to break your concentration. 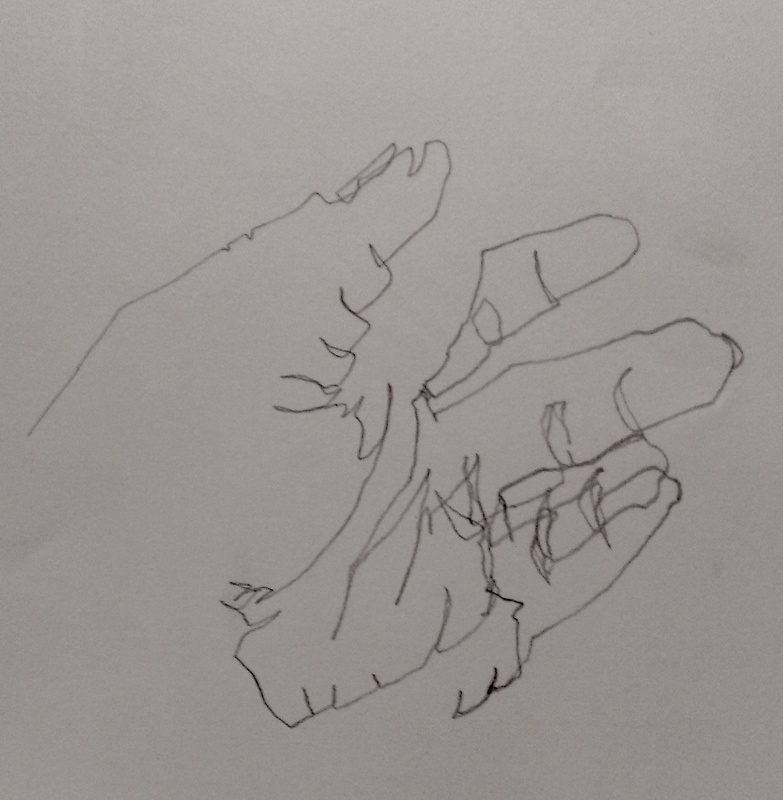 When you’re finished, share your blind contour drawing with us! Send us a photo of your work along with any tips or thoughts on this exercise using our submission form. We may share it on our blog or in the Student Gallery! Key Lesson Learnings: You have learned how the use of perspective creates a feeling of space. 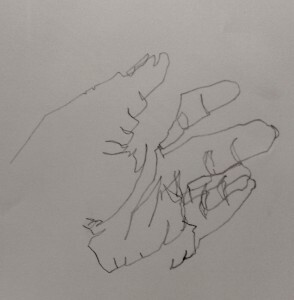 A blind contour drawing is a useful exercise to allow your eyes and hands to work directly together. That’s okay–you can still do a lot with a number 2 pencil and a pink eraser! Try holding your pencil in different ways to vary the thickness of the lines you draw. You can also experiment with both a dull tip and a very sharp tip on your pencil to get different types of lines. Try crosshatching to achieve different values in your drawing. You can use a knife (carefully!) to cut your eraser down so you have a sharp point for erasing fine areas in your drawing. The possibilities are limited only by your imagination–not your materials!